Design for a pendant… playing with scale. I have completed my wire sculptures of the Rabbit and birds and wanted to create a back drop for the sculptures which I hope to elevate from the ceiling in front of it, Using the Design for a pendant printed on acetate and a projector I was able to produce a drawing of the design in pencil on a much larger scale. I have never used a projector and acetate like that before and I felt a little bit like I was cheating at first. The projector was an old school projector and the image was quite blurry the further I took it back but I needed to do this to make the image large enough for a backdrop drawing so I used the projected image as a guide for positioning and referred to the original image as I went along to bring the drawing together. I am really pleased with it, although I had not realised at the time that I had begun to draw the image that my projection was reversed until I begun to add the outline for the rabbits ears. I didn’t mind this to much though as it shows some variation and diversity in the creation and something to learn from. I had thought about turning the image into a large scale Tarot card but I don’t want to upset the drawing, so my tutor suggested there may still be time to do that using the image to create a large scale mono print so that I can have a body of work exploring other materials rather than a final finished piece. 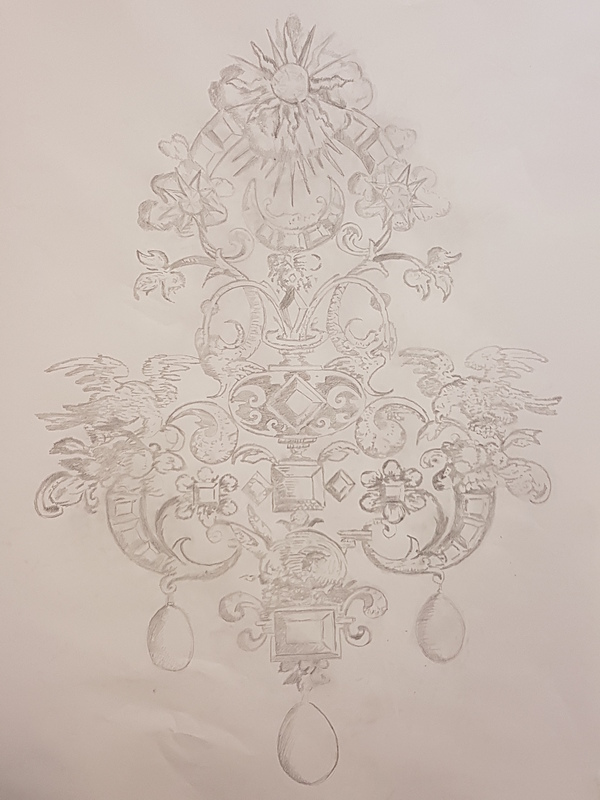 I am moving on to do a Lino of one of the sections of the Design for a pendant to cast it with plaster. I am thinking about Lino printing onto fabric or a cushion cover as well. I am going to visit the making rooms today and explore laser cutting and 3D printing.